The light was gone from her eyes. It seemed like no matter what we did she could not get comfortable and she seemed very unhappy. So we fulfilled our promise and let her out of a body that was no longer serving her. 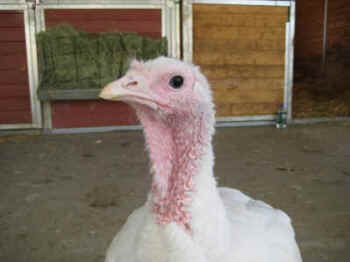 Turkeys are genetically engineered to get very big, very fast so they can be slaughtered at 12 weeks old, still babies. Because of genetic engineering, Portia's body was way bigger than turkeys are suppose to be and by the time she was 2 years old,she could no longer walk. A year ago we built a throne for her and have treated her like queen for the last year and a half. She got treats, fresh water every hour, lots of attention and was very happy here. We always knew there would come a day when she would no longer be comfortable and we promised her that when that day came we would let her go with dignity and grace. Unfortunately, that day came yesterday. As Portia left us we thanked her for always being kind, gentle, loving, and for teaching so many people about what happens to turkeys. We promised her that in her honor and memory we will keep telling her story so that people will know what happens to these beautiful birds. We imagined her spreading her big white wings and flying out of this world as heaven welcomed her home giving her a standing ovation for a job well done!